First of all, a tip of my wing to the producers of "Paulie" for their impeccable taste in selecting a Blue-crowned conure as the star of their movie. I never thought I'd live to see the day! As if there would ever be a movie made about any type of parrot! And if there was a movie to be made about a parrot, I would have bet everything down to my gray underwear it would star one of those blabber-mouth Amazons, or maybe an oh-so-cutesy cockatoo, or one of those gaudy macaws you humans just seem to be so bonkers about. I just never would have dreamed it would be about a conure. A Blue-crowned conure, indeed! What a world! And, of course, I was pleased to see that three other types of conures were featured. A Red-masked, a Nanday, and a Jenday. Bully for them! Yet, not a sun conure in sight! Take that, Tinga! Oh, Tinga's one of my roommates. He's a sun conure. He's convinced he's the most beautiful parrot in the world. Heh, heh. He'll never live this down. You have to have more than just great looks to make it in the movies. Well, come to think about it... I think that only applies to animal actors. Yep, we animals have to have smarts, too. Of course, as a BCC, that Paulie is cute and smart. He knew a good thing when he had it. His best situation was with a little girl named Marie. They were very attached to each other, and were very good for each other. But, as they often do, people messed things all up. Marie's parents decide to send Paulie away. I didn't like that part because I know it's all too common. Sometimes humans don't think of us birds as real people, with feelings, too. Pet birds can get passed around a lot. I've been lucky. I've only been moved once, and I came to a great situation. One of my roommates, Charlie Brown, he's been moved five times! Good thing he ended up with us. In the movie, Paulie gets passed from one situation to another. Some of them are pretty funny. He meets a lot of people, some of them nice, some of them a bit kooky. Yet he is determined to get back to the little girl Marie. Finally, one nice lady takes him to where Paulie lived with Marie. But the family has moved... all the way across the country. It's not a good situation, but Paulie is one hard-headed conure. So off he goes across America... yapping the whole way. I must say I have never heard a parrot talk so much. I think the movie director took a bit of "creative license" in that regard. 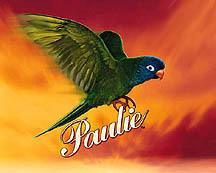 Yet for all his talking, Paulie never utters a real Blue-crowned conure sound. I thought for sure the movie would feature at least a few of our patented hoots or honks. But no. I was very disappointed in that. After all, our native language is beautiful. I find it more than adequate to express myself. So much so that I personally have only bothered to learn one human word, that being "hello", and that particular word only so as to be able to remind my human companion that he really should answer the telephone. Meanwhile, I don't recall ever hearing of any human learning a single parrot word. Makes you wonder. There is one aspect of the movie which is really far-fetched. Can you imagine a Blue-crowned conure falling in love with a Jenday? No way. It's unthinkable. I mean, they have yellow heads!! Scriptwriters, these days. You can tell they don't work with parrots very often. I think that Paulie was a darn good actor to be able to make that scene work. Sure enough, Paulie's talking gets him into big trouble. Before you know it, he's in the slammer, talking to himself to keep from going crazy. That part of the movie bothered me, too. Because as bad as the situation Paulie found himself in down there in that dungeon, getting nothing but seeds to eat, not getting any attention, not being able to see outside... it wasn't much worse than lots and lots of pet birds around the world. I hope their keepers see this movie and think to themselves about how they are treating their pets. The way I see it, if people can't provide a good home for their bird, they should find someone who can. Does Paulie get out of the slammer? Well, you'll have to go see it yourself to find out. As for my conclusion, I give "Paulie" four and a half feathers. It would have gotten a five, if there had been any real conure sounds. Aside from that, it's the best parrot movie ever made. Well, okay, it's the only parrot movie ever made, but for first-timers, they did a fine job. Don't drive a Winnebago with a parrot screaming in your ear. Never lie to your parrot. Best friends come in all packages... including little green, squawky ones.